You know that expression you get what you pay for? It’s true. Once our customers find out that we custom color every batch of stone to their specifications they start to understand we are doing something special at North Star Stone. Clients will bring in a sample of paint, flooring, fabric or window coverings to help create the perfect color of stone. Then we discuss the shape of the stone to create the mood of the room. You don’t get this level customer service at Home Depot, Lowes or most of the specialty stone yards. When it comes to installation some potential customers will hire contractors that are a handyman and assure the client they can lay the stone. Just make sure they know the proper methods of preparing the work surface and use the proper adhesive. (Yes, the DIY’er can install the stone but the trick is taking your time). Our masons have been laying stone for many years and typically only lay stone with a focus on stone veneer. The skill the masons bring to the project includes blending the proper color, shape, texture and size in a pattern that is random, not in a straight line and is not splotchy. Each mason has a slightly different way of laying stone and that is why no two fireplaces will ever look the same, but they will all look beautiful when completed by our masons. Additionally, we pay our masons a fair wage so they can live comfortably, the crews are all insured and a certificate of insurance can always be issued if there is a customer request. When you are reviewing your estimates for a fireplace, review our past projects and customer reviews. 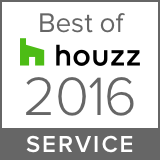 Did you know that North Star Stone has an A+ rating from the BBB and over 65 FIVE Star Ratings on Houzz? We are proud of our custom made stone and the men that install the stone and the unusually high level of customer service. Please call us at 847-996-6850 and let us help you with your next stone project.